While there was some volatility, it was a relatively quiet week for mortgage rates. The major economic data was mixed. In a nice break from the recent upward trend, mortgage rates ended the week with little change. The latest report on housing starts was encouraging. 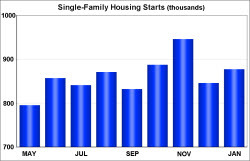 In January, single-family housing starts rose 4% from December. They were 8% higher than a year ago. A lack of inventory has been holding back home sales in many regions, so it's good to see that home builders appear to be picking up the pace of construction. Unlike the housing data, the report on retail sales was disappointing. Excluding the volatile auto component, retail sales in January were flat from December, which was far below the expected increase of 0.5%. The results for December were revised significantly lower as well. Since weaker economic growth reduces the outlook for future inflation, this data was positive for mortgage rates. Offsetting the weakness in retail sales, an upside surprise in the latest report on current inflation levels was decidedly negative for mortgage rates. In January, the core Consumer Price Index (CPI), which excludes the volatile food and energy components, rose 0.3% from December, which was higher than expected. Core CPI was 1.8% higher than a year, which also was a faster rate of increase than expected. Bond yields, including mortgage rates, must rise to offset higher inflation. Comments from a European Central Bank official and stronger than expected data on wage growth were negative for mortgage rates this week. Wednesday's Fed meeting contained no surprises and had little impact. The upward trend seen in recent weeks continued, and mortgage rates ended at the highest levels in years. Unfavorable news for mortgage rates has come from many directions this year. Investors have raised their outlook for economic growth in the U.S., partly due to the tax cuts, and the data has supported this view. Strength has been seen in most regions outside the U.S. as well. While this has been great for the stock market, faster growth raises expectations for future inflation, which is negative for mortgage rates. In addition, the supply and demand dynamics have shifted adversely for mortgage rates. The U.S. budget deficit is projected to increase, adding to the supply of bonds. Meanwhile, investors are concerned about decreased demand for bonds globally. On January 10, a report was released suggesting that China may scale back its purchases of U.S. bonds in response to trade tensions. There also have been hints that European Central Bank (ECB) officials have begun to discuss when to end the ECB's bond purchase program. The potential for greater supply and less demand has been one reason that investors have pushed global bond yields, including U.S. mortgage rates, higher. The latest blow to bonds from the ECB took place on Monday. An ECB official said that the ECB should end its bond purchases as soon as possible after the current program ends in September. This was one of the most direct displays of support for ending the bond purchase program yet, and global bond yields moved higher. Average hourly earnings in January were 2.9% higher than a year ago, up from an upwardly revised annual rate of 2.7% in December, and the highest level in eight years. Other than the two months distorted by the hurricanes, wage growth held steady around 2.5% for most of 2017. Weaker than expected labor market data was positive for mortgage rates this week. However, this was offset by a rally in the stock market, which pulled assets out of the bond market. The net effect was that mortgage rates ended the week with little change. The U.S. ended a great year for job growth on a mildly disappointing note. Against a consensus forecast of 190,000, the economy added just 148,000 jobs in December. Despite the shortfall, however, average job gains over the last three months were a strong 204,000. It appears that an early Thanksgiving holiday may have pulled some hiring into November from December in the retail sector. The unemployment rate remained at 4.1%, the lowest level since 2000. Average hourly earnings, an indicator of wage growth, were 2.5% higher than a year ago, up from 2.4% last month. The small miss in job growth was slightly positive for mortgage rates. The minutes from the December 13 Fed meeting released on Wednesday contained no significant surprises. At the meeting, Fed officials spent a lot of time debating the likely impact of the recent tax cuts on economic growth. The minutes also revealed that officials remained divided about whether the low levels of inflation seen in 2017 were mostly due to temporary factors or long-term ones. Investor expectations for the pace of future rate hikes were nearly unchanged after the release of the minutes. ECB "The Announced Taper" - Check This Out! The most highly anticipated event of last week, the European Central Bank meeting, contained no surprises and caused little reaction even though they expected much more from the ECB meeting, it turned into a yawner. Reports about President Trump's favored pick for the next U.S. Fed Chair caused some volatility during the week but had only a small net effect. The key GDP report also was not much of a market mover. In the end, mortgage rates finished the week slightly higher. At Thursday's meeting, the European Central Bank (ECB) announced future plans for its bond purchase program which closely matched investor expectations. The ECB will extend its bond purchase program from its current end date in December by nine months to September and will reduce its monthly purchases from its current level of 60 billion euros to 30 billion euros beginning in January. The market took this in stride. President Trump is expected to soon announce his nominee to serve the next term as Fed Chair. On Tuesday, it was reported that the two leading contenders out of the many people under consideration were Jerome Powell and John Taylor. The report that Taylor is one of the two finalists caused some concern for investors. Taylor is viewed as the candidate most in favor of a more rapid increase in the federal funds rate. The news caused mortgage rates to move higher. On Friday, however, another report named Powell as the top choice. Under Powell, it is expected that the Fed would maintain a course for monetary policy similar to the current Fed policy. Following the news, mortgage rates offset the increase from the report on Tuesday. The market is betting against the economist in favor of Powell who will steer things pretty much as the Fed has been doing for the last few years. Yellen is believed out of the running due mostly to her very favorable comments over the years for the Obama economic agenda. 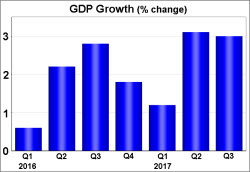 The first estimate for third quarter Gross Domestic Product (GDP) growth released on Friday was 3.0%, well above the consensus forecast of 2.5%. However, an increase in inventories accounted for 0.7% of the growth. An increase in inventories is typically viewed similar to a one-time event and is discounted when evaluating the underlying strength of the economy. Due to the large influence of inventory levels on the results, investors considered the GDP data to be close to the expected levels and showed little reaction. But Trump's pro growth plans have additional running room if the 4th quarter does well. Based on recent reports the economy and jobs seem to be on the rise. Let's keep our fingers cross for continued prosperity, whether your a Democrat or a Republican we all want better times so we can all prosper, we all can hopefully agree to that! The passage of a budget plan was negative for mortgage rates this week. The economic data had little impact. As a result, mortgage rates ended the week higher. Late Thursday, the Senate voted in favor of a 2018 budget plan. This was a key early step along the path to tax reform. Investors viewed the progress on tax reform as negative for mortgage rates for a couple of reasons. First, a new tax plan likely would boost economic growth, which would raise the outlook for future inflation. In addition, it would increase the budget deficit. The added supply of bonds needed to fund the deficit would push yields higher. The headline figures released on Wednesday for housing starts in September were disappointing. However, digging deeper it was clear that the data was heavily influenced by the impact of the recent hurricanes, and the market reaction was small. 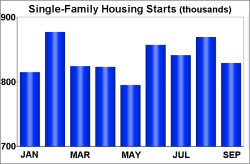 After three months of strong results, single-family housing starts in September fell 5% from August, which was a much larger than expected drop. While starts rose in the Northeast, the West, and the Midwest, they suffered a massive 15% decline in the South, where the bulk of the hurricane damage took place. Existing home sales in September posted their first gain in 4 months rising .7%. Overall sales are flat. Down 1.5% compared to sales one year ago. So even prior to the hurricanes sales of real estate have not been great. It is reported because of tight inventory, which is true, however I feel for sales to start picking up again buyers need to start receiving higher wages. To date wages have risen 2.5% on average just barely helping families. Health care cost is not receiving enough blame for keeping our economy in the doldrums. Hopefully our government will wake up to this reality sooner than later. Progress on the Tax Plan Beckons Higher Interest Rates! Additional threats from North Korea were positive for mortgage rates early in the week. However, the announcement of a tax reform plan on Wednesday was negative. The two events were roughly offsetting, and mortgage rates ended the week just slightly higher. On Monday, North Korean officials said that they interpreted recent comments made by President Trump as a declaration of war. Investors reacted to this by shifting to relatively safer assets, including mortgage-backed securities (MBS). The increased demand for MBS caused mortgage rates to decline. The volatility seen this week continued on Wednesday, but the movement was in the opposite direction from Monday. It took place after President Trump released additional details about his proposed tax reform plan. If passed, this plan is expected to boost economic growth and to increase the budget deficit. Faster economic growth raises the outlook for future inflation, which is negative for mortgage rates. A larger deficit increases the supply of bonds, which also is bad for mortgage rates. 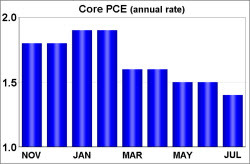 In August, core PCE was just 1.3% higher than a year ago, down from an annual rate of 1.4% in July and from 1.9% in February. This is the inflation indicator favored by the Fed. Most Fed officials expect that inflation will gradually rise toward their target level of 2.0% over the medium term, but each additional month of low readings adds doubt that their forecasts are correct. Looking ahead, the important monthly Employment report will be released on Friday. As usual, this data on the number of jobs, the unemployment rate, and wage inflation will be the most highly anticipated economic data of the month. Before that, the ISM national manufacturing index will be released on Monday, and the ISM national services index on Wednesday. In addition news about North Korea or tax reform again could influence mortgage rates. The Fed: To Raise or To Not Raise, That is the Question? You’re going to need a job to buy that new IPhone X, and so a good thing that U.S. job openings rose to a record high in July, suggesting the slowdown in job growth in August was an aberration and that the labor market was strong before the recent disruptive hurricanes. The Labor Department says openings edged up 0.9 percent from June to 6.2 million, the highest on records dating to 2000. Hiring also increased, but the record number of openings make clear that employers have plenty of jobs to fill but are still searching to find qualified workers at the pay levels being offered. The number of people who quit their jobs also rose, a trend that generally means workers are leaving for jobs that pay better. More job openings were posted in construction and manufacturing, along with health care, professional and business services and the information sector. U.S. stocks opened sharply higher last Monday as the damage from Hurricane Irma didn't appear to be as bad as feared. Hurricane Irma, once a Category 5 hurricane, hit the coast of Florida the weekend before last. U.S. stocks rose to record levels last Friday and posted strong weekly gains. The S&P 500 finished at 2,500.23, marking the first time the index broke 2,500. The three major indices finished the week at least 1.4 percent higher. Homebuyers are clamoring to capitalize on the lowest interest rates in almost a year, driving total mortgage application volume 9.9 percent higher the week before last. After declining for weeks, mortgage applications to purchase a home jumped 11 percent and were 7 percent higher than a year ago. There is plenty of pent-up demand from buyers over the summer who ran up against tight inventory. Mortgage applications to refinance a home loan, which are highly rate-sensitive, rose 9 percent. They are still 35 percent lower compared than the same week one year ago, when interest rates were slightly lower. Mortgage rates began moving higher last week, as concerns abated about North Korea, which had pushed investors to the relative safety of the bond markets. According to the latest data released by Freddie Mac, the 30-year fixed rate average held steady at 3.78 percent. Consumer prices rose 0.4 percent in August and 1.9 percent from a year ago, lifted by a rise in energy prices, the Labor Department reported last Thursday. The monthly gain was the biggest since January. Food at home prices fell 0.2% on the month, which saw Amazon complete its Whole Foods Markets acquisition and immediately cut prices on items like kale and avocados by up to 43 percent. It's not clear if the Bureau of Labor Statistics picked up those price cuts that didn't hit until Aug. 28. Target followed last week by announcing its own plan to slash prices. Speaking of Amazon, it is a terrible time to be a brick-and-mortar retailer. Investors are placing huge wagers that Amazon and fast fashion retailers will knock out more and more stores in the months and years to come. Unfortunately for retail employees and investors, anemic sales have forced hundreds of store closures and tens of thousands of layoffs. Examples of this include Macy’s, which has lost two-thirds its market value over the last two years, and JCPenny’s declining 90 percent since early 2012. On average, 15.6 percent of the shares among retailers are being shorted, which is considered a very high level. Shorting a stock typically means borrowing it from a broker and immediately selling it, in hopes it can be bough back at an even lower price. It can be a very risky strategy that can backfire if the stock price keeps rising. All of this doom-and-gloom is driven by dramatic shifts in consumer behavior. Americans are increasingly shunning the mall in favor of Amazon and other sites to get their shopping done. At the same time, the stores that have survived are having a very hard time competing with fast fashion brands like Zara and H&M. All eyes will be on the Fed this Wednesday as questions around a rate hike looms. The chance of a quarter point increase in December has climbed to 50 percent from 31 percent in early September, according to CME Group’s FedWatch tool. Additionally, we will get data on Housing Starts on Tuesday. Information provided by NYCB Secondary markets. This is “H” as in “hurricanes", or in “Harvey.” As our thoughts are with those affected by these powerful acts of nature as they are still bracing for survival and recovery, there are already attempts underway to estimate the economic impact of the double natural disaster. The extent of damage from Hurricane Irma, which pounded Florida over the weekend, is not yet clear. However, its power, and the sole fact that it comes right after Harvey, which brought devastation to the fourth largest U.S. city, Houston, among other damages, creates expectations of a profound financial impact. In Florida, tourism and agriculture are expected to suffer the most. Air travel, energy, and gasoline distributors will reel mostly from the side effects of damaged infrastructure. Harvey is already forecasted to affect the broader economy and will be blamed for higher jobless claims, less new jobs created, higher inflation, lower consumer spending, and weakness in the housing market in the Houston area, that unto itself comprises a sizable share of the national market. The good news is that all of those issues are predicted to be short-lived and should reverse as recovery picks up later in the year and into next year. The best news regarding July Factory Orders, reported last week, was an upward revision of the previous (June) growth report from 3 to 3.2 percent. Otherwise, the 3.3 percent decline in July was quite disappointing, even though it came in line with projections. The ISM Non-Manufacturing Index for August added some optimism when it posted at a solid 55.3 level, higher than the previous month’s reading and supportive of the consensus forecast. The PMI Services index was also very strong for August. The Beige Book, an economic condition report ahead of the FOMC meeting, did not anticipate any significant rise in inflation despite gasoline price hikes due to tight supply. At the same time, the report highlights upcoming weakness in the key indicators of economic growth, based on the early assessments of hurricane Harvey impact, and does not prompt any urgency in withdrawing government support for the economy. 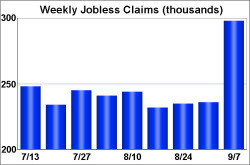 Jobless claims started picking up this week, as a result of Hurricane Harvey. Productivity increased in the second quarter, and pushed labor costs down. According to the Consumer Credit report, consumer debt increased mostly due to higher credit card balances. Mortgage interest rates kept sliding downwards this week, per Freddie Mac’s Primary Mortgage Market Survey, with the 30-year fixed mortgage national average at 3.78 percent and 5/1 ARMs at 3.15 percent. The inflation measures will be posted this week – look out for the Producer Price Index on Wednesday and Consumer Price Index on Thursday. Industrial Production and Business Inventories, along with Consumer Sentiment and Retail Sales, will make Friday busy. As skies start clearing up after the hurricanes, let us enjoy the escaping summer at its best. Stay tuned. An increase in tensions with North Korea was positive for mortgage rates early in the week. Political headlines then caused some volatility later in the week, but the net impact was small. At Thursday's meeting, the European Central Bank (ECB) essentially postponed a discussion about tapering its bond buying program until its next meeting, so there was little reaction. The net effect was that mortgage rates reached the best levels of the year. Geopolitical events were the primary influence on mortgage rates over the past week. On Sunday, North Korea conducted its most powerful missile test yet. Once again, the reaction from investors to the increase in tensions was to buy relatively safer assets such as U.S. mortgage-backed securities (MBS). The added demand for MBS caused mortgage rates to decline. Later in the week, mortgage rates rose and then fell based on shifting prospects for a plan to extend the debt ceiling.Increases in uncertainty about the debt ceiling have been good for mortgage rates. Conversely, when signs of progress on a plan have appeared, it has been negative for rates. The effects of Hurricane Harvey were evident in the latest report on Jobless Claims which is released every Thursday. After holding very steady at levels near 240,000 for the last couple of months, claims jumped to 298,000 this week. This was the highest level since April 2015. It also was the largest weekly increase since 2012. Looking ahead, the JOLTS report, which measures job openings and labor turnover rates, will be released on Tuesday. The Consumer Price Index (CPI) will come out on Thursday. CPI is a widely followed monthly inflation report that looks at the price change for goods and services which are purchased by consumers. Retail Sales will be released on Friday. Consumer spending accounts for about 70% of economic activity in the U.S., and the retail sales data is a key indicator. In addition, there will be Treasury auctions on Monday, Tuesday, and Wednesday. Headlines about the debt ceiling also could cause volatility in mortgage rates again. News of the Day, Stop the Press!!! The Latest Employment and Inflation Numbers. Will you have a Job on Tuesday. This week's highly anticipated inflation data was roughly in line with expectations and had little impact. An increase in tensions with North Korea was positive for mortgage rates early in the week. However, stronger than expected manufacturing data had an offsetting effect on Friday. As a result, mortgage rates were little changed, remaining near the best levels of the year. Investors were most focused on the inflation data this week. 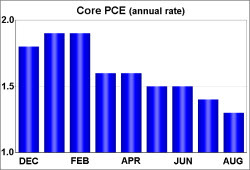 On Thursday, the core PCE price index for July matched expectations with an annual rate of increase of 1.4%, down from an annual rate of 1.5% in June and from 1.8% as recently as February. This is the inflation indicator favored by the Fed, and Fed officials would like to see inflation rise to their target level of 2.0%. On Friday, another inflation indicator, the earnings component of the Employment report, showed that the annual rate of wage growth in August held steady from July at historically low levels. This week's tame inflation data continued the recent trend of steady or lower readings, which has been good for mortgage rates. The primary source of improvement for mortgage rates during the week was an unusually provocative action by North Korea on Tuesday. North Korea tested a missile and flew it over Japan. The reaction from investors to the increase in tensions was to buy relatively safer assets such as U.S. mortgage-backed securities, causing mortgage rates to decline a little. 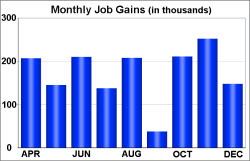 On Friday, the key monthly Employment report revealed that job gains in August were a little lower than expected. However, the shortfall was small enough that there was little change in mortgage rates due to the data. Later Friday morning, the data did cause a reaction. The ISM national manufacturing index jumped to 58.8, which was much higher than expected. Stronger economic growth causes investors to raise their outlook for future inflation, so this report was a bit negative for mortgage rates. Looking ahead, investors will be focused on Thursday's European Central Bank (ECB) meeting. They will be looking for information about future plans for tapering the ECB's bond buying program. A Total Solar Eclipse of the Sun! Will the Market Eclipse Also? The World is in Turmoil ! What are you going to do about it?